A young woman comes aboard as an intern, but when she starts to display amazing powers, Q appears to determine if she belongs with the Q Continuum. How does an intern rise to the level of Captain Picard calling her a "rather unusual passenger" in his Captain's Log? It seems like her arrival should be pretty routine, and aside from being smart, Picard knows nothing about her that makes her noteworthy yet. 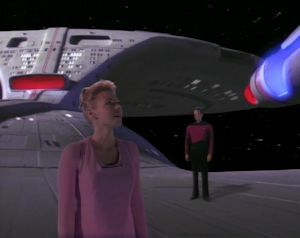 The premise of this episode is similar to the TOS episode "Charlie X," although Charlie uses his powers selfishly whereas Amanda just wants to use them to help people. You'd think Riker could be a bit more instructive in this episode, since he was faced with exactly the same choice in "Hide and Q." The fact that it's never even brought up is an uncharacteristic oversight, but maybe the writers were trying not to remind the audience that they've covered this ground before. This isn't a bad episode in its own right, but it's pretty lacking when combined with all the Trek that precedes it. It's a rehash of several older ideas--barely offering any kind of a unique spin on them--and it continues to use Q in a disappointingly mediocre way. The show is struggling at this point, which might have to do with the loss of Gene Roddenberry's input or with behind-the-scenes resources being redistributed in anticipation for the launch of DS9 (which was only a couple of months away). Regardless of the reasons, TNG is treading water, offering episodes that aren't bad, but aren't great either. It's gotten too episodic, neglecting the bigger character arcs that had been building in the previous few seasons. "The jury is still out on that, Picard," Q says concerning the trial he put all of humanity on in "Encounter at Farpoint." Had the writers already planned to end the series the way they had started it? Had they already conceptualized the basic idea behind "All Good Things..."?